I’m back in civilisation! The Canning Stock Route was an awesome trip and a great experience, is it a photographers delight? I’m not sure that it is. The track runs through some very sparse and vast tracts of land and I think that is a real photography issue, there really isn’t that much to photograph. Having said that, it was a life experience and as the above photo shows, if you don’t take it seriously you are in real trouble. There was stacks of car and trailer carnage out there. The real highlight of the trip for me was our trip to Rundell River National Park on our way out of the Canning Stock Route, I’ll put some photos up shortly from the park. This entry was posted in Australian Landscapes and tagged australia, canning stock route, desert, Jamie Paterson, landscape, little sandy desert, north west, panoramic, perth, photo, photography, western australia. Welcome back! Look forward to seeing more of your shots. 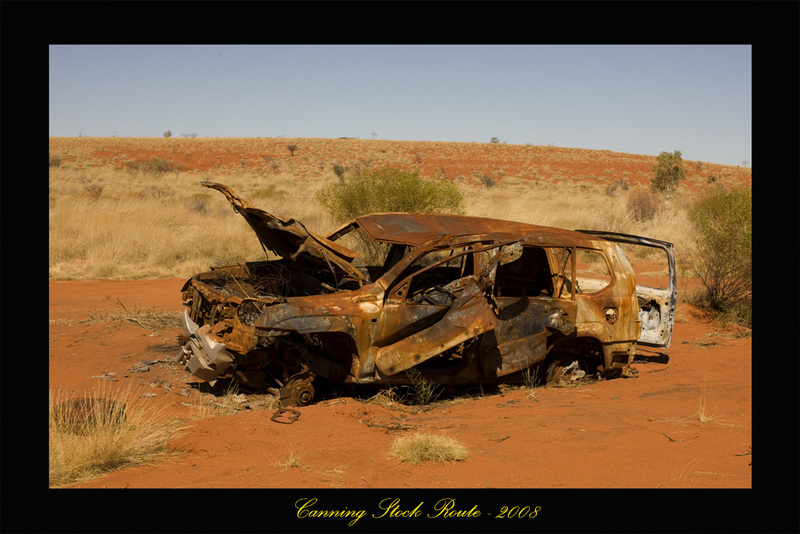 The more desolate hot and arid a place is the more I love it so I’m sure I would love the Canning Stock Route! In that case you would be in your element on the Canning Stock Route. It is certainly, desolate, dry, and arid, though at this time of year its not too hot fortunately. The total lack of water was obviously no surprise but it really got to me not having a daily shower, the flies loved it though! Jamie mate I reckon this image would look really cool if you did some intense work photoshop work on it to give it a kind of post-fire feel. Like a real dark mood. Thanks for that. I’ll get to it, I need to learn more about PS. What would you have done to it? Bearing in mind I’ve done no editing on this photo so far. I just wanted to let the world know that I’m back. LOL.